What can we learn from looking at England in 1820? On the one hand, a great deal, but having said that, our understanding of this period has been hobbled by habitual Anglo-centricity. Even broadening out the scope of things and examining all four kingdoms of the United Kingdom does not suffice. Great Britain and Ireland have to be seen in the context of 1820 being a year of European revolution. In September of that year, a leading London radical wrote that Thomas Paine, who died over a decade earlier, had ‘thought that he lived in the age of revolution…but the present moment better deserves that epithet’. The revolutionary climate of 1820 was without parallel until 1848 and the actions of the British government, led by a Prime Minister (Lord Liverpool) who had actually witnessed the storming of the Bastille in 1789, must be evaluated in that context. The heir to the French throne was assassinated and there were revolutions in Spain, Portugal and much of present-day Italy. And if we look to the early months of 1821 as well, there was a further Italian insurgency, insurrections against the Ottomans in Moldavia and Wallachia, and the dramatic development of an independence movement in Greece. 1820 was the most testing year for any nineteenth-century peacetime government. Stringent measures to suppress radical political activity had been introduced by Liverpool’s Ministry in the wake of the Peterloo massacre the previous August. Their effect, however, was mainly to drive protest underground and make it harder to monitor, while simultaneously stimulating the popular press to yet-more innovative forms of expression. Against a widely rumoured background of revolutionary conspiracy, there were popular uprisings in Scotland and northern England. Bitter social conflict in western Ireland, expressed mainly through an elusive protest movement called the Ribbonmen, tied-down whole regiments of the army. Back in London elements within the Brigade of Guards were mutinous. And a conspiracy to assassinate the entire Cabinet was only narrowly averted. On top of all this George IV forced an embattled and nervous government to secure his divorce from Queen Caroline. Unprecedented popular indignation ensued, much of it from women reflecting a new politics of gender. The Caroline affair also triggered what we would now call a media frenzy: an explosion of satirical cartoons and pamphleteering, often ribald and some of it downright obscene, but all of it pointing to a revolution in popular print and political opinion. Yet the political and social stability of the United Kingdom was maintained. It’s very interesting to think about not only how government was tested to the limit, but also how the processes and mechanisms through which social and political stability were maintained. A sense of involvement in – and ownership of – government increased among ‘the middling sort’. Ratepayers, who fell below the threshold for parliamentary voting or for service as magistrates, were being given an increasing stake in the government of the communities in which they lived. This process even occasionally included women too. However, this book suggests that the ‘age of reform’ was a drawing out of processes that had been established earlier. The survival of parliament’s authority in 1820 may have been severely tested but how it survived is enlightening about the social and political stability of the United Kingdom in the longer perspective. 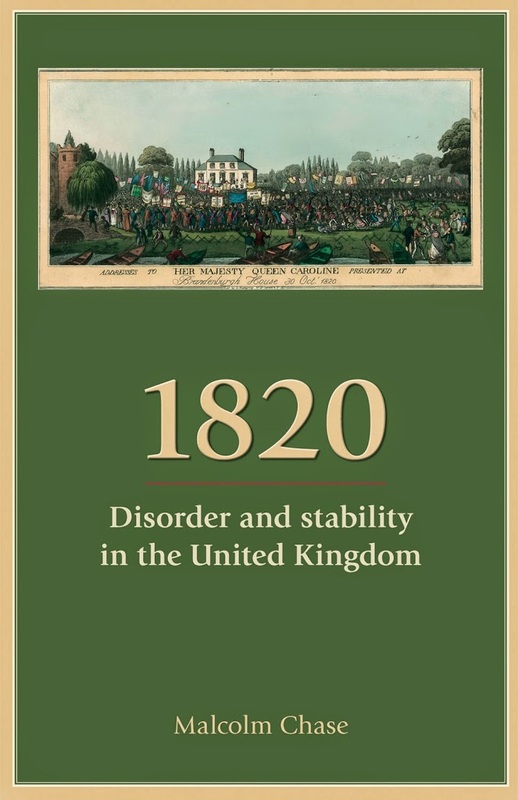 My book, 1820: disorder and stability in the United Kingdom takes this single, fascinating year in the broader context of Europe, revolution, and the periods before and after, to give a far longer perspective on the social and political stability of the United Kingdom. Category: Cultural Studies, History, Irish Studies	22 Comments.